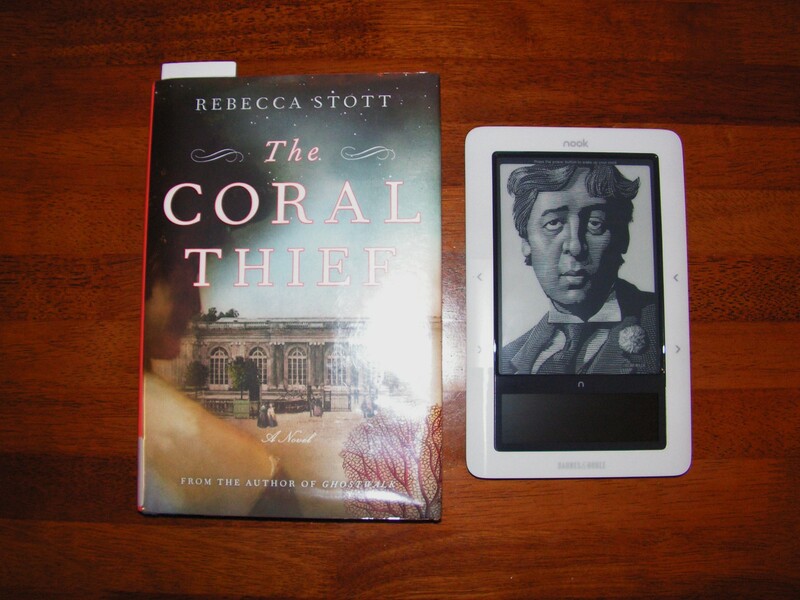 I’ve had the opportunity to finish a book on my new Nook and thought it might be a good time for a review. In case you’re curious as to what it looks like, see photos below. It’s smaller than a hardcover book, weighs about the same as a book, and is comfortable to hold. As I said, I have only read one book on the device but it was a pleasant experience. The eink (I don’t know what the technical term is here so just play along.) is extremely easy on the eyes and after reading over a 100 pages in one sitting, my eyes didn’t bother me at all. I was incredibly surprised and pleased by that. The screen is not back lit so you will need to use it in a well lit area but this is also true of a regular book. When flipping pages, there is a slight delay as the next page loads, and when opening a new book, a formatting box appears asking you to wait while your book choice loads, but I didn’t find either of these things incredibly annoying. I read a few reviews where this was a major focus and for me it wasn’t. The 2.5 – 3 seconds I waited didn’t feel like an eternity to me but for others it might. Downloading books is tremendously easy which can lead to purchases you didn’t plan on making. I have so far not allowed myself to wantonly download but one can see how it can easily happen. You can download/purchase books through the Barnes & Noble website or directly on the device. Using the website is much like purchasing a regular book and then you just download the books to the device. On the device itself, you can flip through a list of about 100,000+ pages of books (you’ll be there for days) or use the small and somewhat annoying search feature. The small box below the reading screen is the navigation and turns into a small touch keypad to search. It’s awkwardly sensitive and can be hard to type on but does the job just fine once you get the feel of it. (Make sure you spell the name of the book correctly as it does not auto-correct and will only pull exact matches.) The touch screen can also be used to flip pages and scroll through book covers for purchasing books. In addition to books, magazine and newspaper subscriptions can also be purchased. We have yet to use this feature. You can download approximately 1,500 books to the Nook. If you would like to add more storage space for extra books, you can add an SD card. I find this important to mention — before you can actually download anything you have to register your device with Barnes & Noble and setup an account. It’s not all that difficult but it is annoying and we had to do it twice because we did it out of order which meant creating then deleting an account and then creating another one. Annoying, very. Difficult, no. One thing to note while searching for books to download — a few were in the wrong category. We noticed several very clearly noted history books in the fiction section and some fiction in the history section. I don’t see this as a major issue just something to note under bugs. The settings do allow you to change the size of the font, type of font, and brightness of the screen. All very useful. It will work on a wi-fi signal and the 3G network. Keeping the wi-fi and 3G off will get you several days worth of power, with it on, slightly less. If you are just reading with the wi-fi turned off, which is what I mostly do, battery issues are minor. While I was satisfied and really quite happy with the reading experience, I did find it a bit buggy. When you open a book, and begin to read, you can set a bookmark to hold your place. I did this and when I came back to the book the next day, found myself at an entirely new place. Hmm… Luckily, I remembered where I was and quickly skipped ahead to the chapter I wanted which you can easily do using the navigation system. Not a big problem, but it’s annoying if you’re reading more than one book and have to keep track of which chapter/page you left off on. Oddly, the book my husband is reading didn’t have the same bookmark issue. I was left wondering if it was just that particular book since I’ve not experienced this problem since. You can download PDF files to be read on the Nook. I have an ebook and was easily able to drag and drop the book onto the device when it was plugged in to the laptop. I was extraordinarily happy with the ease here. I didn’t have to load any software, just plugged in the Nook with the USB cord, the laptop said, “I see you have new device. You have a Nook. You can use it now.” OK, so it didn’t really say that but it was really that easy. I didn’t have to do a thing which prompted my husband to say, “Good, they Amy proofed it.” Which means, plug and play. I don’t like to play around with technology. I want to plug it in and have it work. The Nook did that. I hope to borrow a few books from the library this way was well. If you have an older computer, I can’t speak to ease here so take caution with this note. It will read audio books but I haven’t tried this out yet and since I don’t listen to many anyway, it may be a long while before I get to this feature. I’m not a tech person. I still have a phone that doesn’t take pictures and that’s by choice. (Don’t make fun! :-)) When I buy a device, I like it to do what it promises. 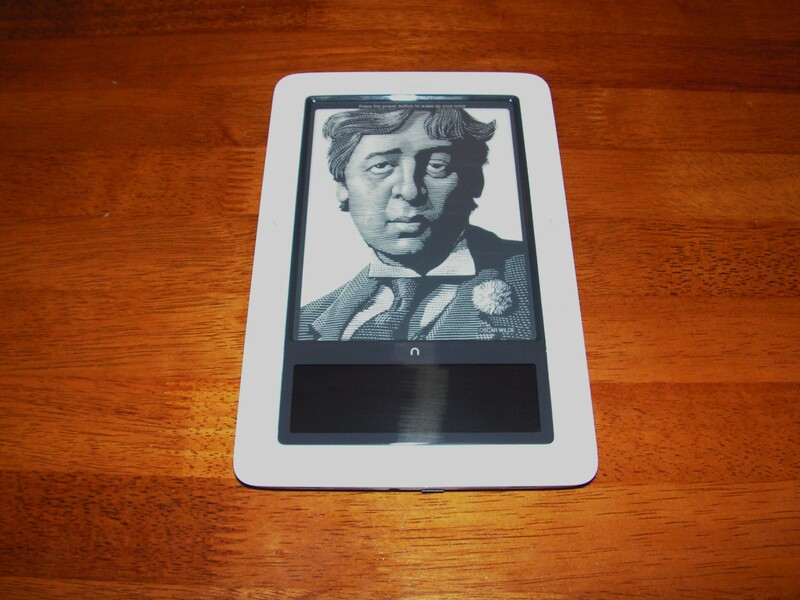 The Nook promises to be an ereader and that’s what it does best for me. I want to download a book and I want to read it. I can easily do that on the Nook. I found it simple to use. I didn’t feel I needed to call tech support to do anything on it. I like that. Yes, there are many little features and things that my husband (the tech person in the household) found and tried to to interest me in, but I just want to read on it. If you’re looking for something more, maybe another device would be better. If you just want to read, the Nook works. If you’re a tech person, maybe there are enough things here to keep you happy, but since I don’t play with them, and probably won’t, I can’t answer that for you. One thing I do want to mention is the packaging. When the Nook arrived it was beautifully packaged in this clear and white plastic contraption. I spent several minutes contemplating how best to remove it then spent 20 minutes trying to pry it out of the plastic prison. Why do this? I don’t know and I was highly annoyed by the time I got it out. At that point I also found out I needed to charge it before I could play with it which meant more waiting. Between shipping problems, removing of packaging, and waiting for it to charge, I spent a lot of time, well, waiting. All in all, I like the Nook. It works well for what I want and need and I hope in the end it will provide the tired and straining bookshelves with a little respite. If you want to know something specific, leave me a comment and I’ll be happy to answer. NOTE: The Nook I’m reviewing here was bought as a birthday present for me by my husband. I have not been asked to do this review by anyone and I get nothing out of posting it here. I have not been compensated for my views stated above. It is solely my opinion. Great detailed review. I got the Kindle for Christmas and I’m very happy. No review on the Nook has made me feel like ohhhhhh I should have waited, I’m very pleased. Enjoy – I find myself reading faster on the Kindle, I think its amazing how easy it is to read also. I read pretty fast due to speed reading software I used last year. Will I be able to read even faster with a Nook? That would be great. I could get through so many books.